Danze Amalfi Brushed Nickel Single Handle Bathroom Centerset Faucet w/Drain: This Danze Amalfi Collection Centerset Bathroom Faucet is built to last. The highest quality standards are used to precision manufacturer a top of the line fixture. Important features of this 100% BRAND NEW Fixture: Complete Item! Everything necessary for installation is included. Brushed Nickel Single Handle Bathroom Sink Faucet - Single Handle Centerset Bathroom Faucet, Single hole mount, Amalfi Collection, w/touch down drain, w/deck cover - The Amalfi single handle lavatory faucet offers a contemporary style with a sleek design that is sure to catch the eye. Accessorize your home with the simple, yet fashionable feel of Amalfi. Installation is easy and won't take long at all. 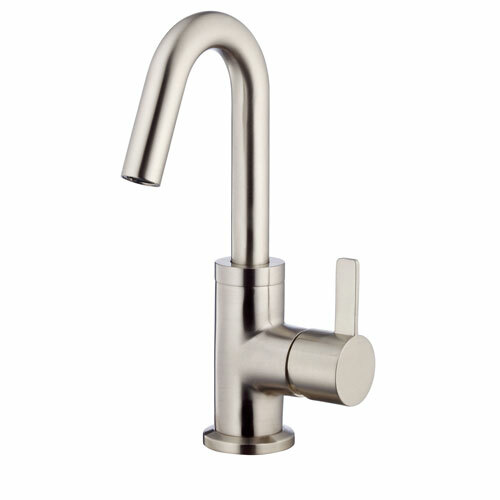 - Single handle lever design for easy use and temperature control - Ceramic Disc Valves provide drip-free shut off for life as well as smooth and easy handle operation. - Brushed Nickel premier finish designed to resist fading and tarnishing. - Touch down drain assembly included for easy installation - Watersense certified faucet helps reduce water use - ADA compliant for easy operation - Single Handle Faucet - Matching Accessories Available - Easy to Install - Installation instructions included. This fixture is manufactured by Danze and is part of their Amalfi Collection. The Amalfi single handle lavatory faucet offers a contemporary style with a sleek design that is sure to catch the eye. Accessorize your home with the simple, yet fashionable feel of Amalfi. Installation is easy and won't take long at all.